Welcome to America before Interstates. ←START HERE. Focus on the vertical bar on the left to begin. Select a depot, then catch a train to the "big city". Check out the scenery along the way. Explore America as it used to be, using only your mouse. Prior to WWII, the gateway for thousands of small towns across America, was their railroad depot. Mail, news, food, rooms, taxis, and visitors, could all be found down by the depot. A few short years later, the train depots gave way to service stations, motor lodges, and roadside cafes. Escape to a simpler time exploring America as it was before Interstate highways. 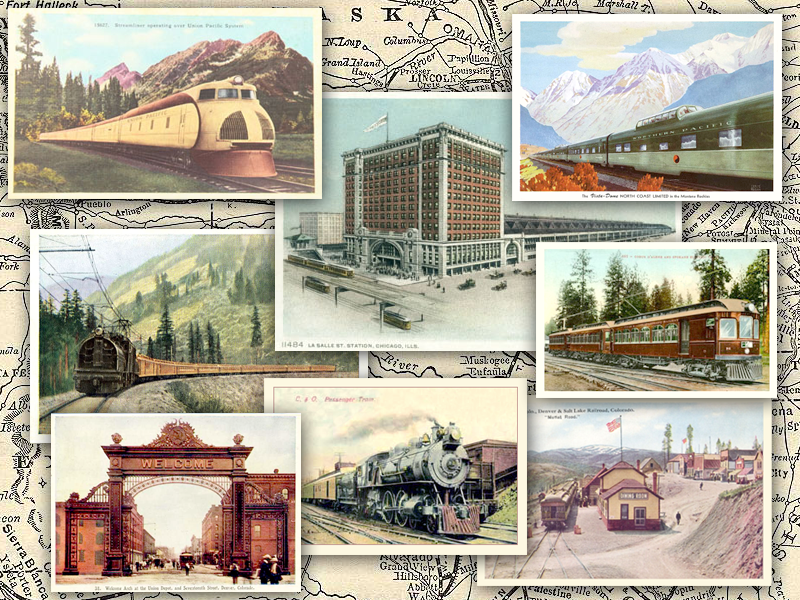 Catch a train or interurban, view postcards of the depots, towns and scenery along the way. Step off at any point along your route to view more postcards. Board your train, or any other outbound train, to explore still farther along the American railroads. Rail Lines - Thousands of rail lines. Passenger lines are listed first, or search by letter for thousands of 20th century rail lines. View details of over 11,000 trains (1,800 named) on hundreds of rail lines. Trains - Select by letter from over 1,800 named trains and view it's route, or details of any town along it. Over 80,000 train stops are indexed. Trains operated by several lines, are showed by line. Click to view details of each section. Depots - Locate any of thousands of depots and terminals. View a timetable of all outbound and through trains. Major depots are listed first, or view a detailed list of over 9,500 depots by selecting a particular state. Highways - Soon, you will be able to view routes of all the old federal highways. Postcards - Search for towns, parks, rivers, or other landmarks. Over 8,500 pre-WWII postcards are indexed.